Ash trees make graceful landscape plants, but when your trees are stressed or plagued by pests, they may begin to shed bark in response to the damage they’re experiencing. 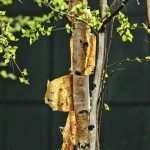 As a good ash tree owner, it’s your job to determine if ash tree bark peeling is a sign of environmental problems or if the bark coming off ash trees is due to boring beetles. Read on for more information on these common ash tree problems and their management. 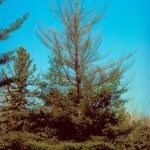 When your ash tree is shedding bark, it may feel like time to panic, but try to keep your cool, often, this is simply indicating an easily correctable environmental problem. Ash trees typically grow on or near the banks of permanent water sources like streams and ponds. Because of this, they’re not very adaptable when the weather dries out and they can’t get the moisture they require. Often, they’ll shed bark in protest, but quick action on your part can slow or stop your ash tree losing bark. 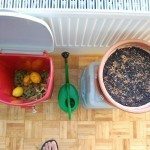 Provide the tree in question with ample water, up to 210 gallons a week during the summer for a tree with a 15-foot wide canopy, being sure to water at the drip line instead of near the trunk. An irrigation system can help keep your thirsty ash tree supplied with water. 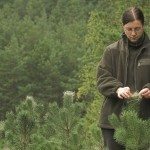 Other stressors like a sudden change in environment, such as trenching, removing the grass around the tree, herbicide use, over-fertilization or the failure of your irrigation system can also end in bark shedding. Water a stressed tree well, withholding fertilizer until the tree show signs of improvement. Over-pruning is a common cause of an ash tree bark problem; the removal of branches that once shaded the trunk can lead to sunburn on these previously protected tissues. Sunburned bark may peel and fall off the tree in question and emerald ash borers can find their way to these easy to penetrate areas of tissue. Once sunburn has occurred, there’s no way to repair it but you can prevent it in the future by being careful to prune out less than a quarter of the living branches of an ash tree during any season. Check your damaged tree’s trunk for small holes before dressing the wounded areas with a trunk wrap or painting it with white latex paint mixed with equal parts water. If tiny d-shaped holes are peppered in the areas of peeling bark, you have a much more serious problem on your hands. This is the telltale sign of the emerald ash borer, a serious pest of ash trees. Trees that have been infested a while may have many dying branches and aggressive shoot growth around the base of the tree in addition to the bark peeling and holes in the trunk. 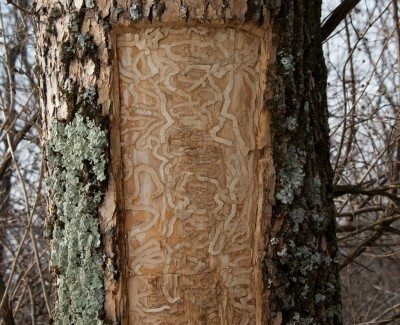 Generally, borers are a death sentence for a tree – these insect pests spend most of their lives inside affected trees, causing a slow decline as they chew through the transport tissues that keep the tree hydrated and nourished. Once these are severed, it’s only a matter of time before the tree dies. A large tree can present a serious hazard to objects and people on the ground below – have your tree evaluated by an arborist if you suspect borers. Removal is typically your only option.